Cork Gay Collective at Dublin Pride 1983. Donal Sheehan and Pat McCarthy with Cork Gay Collective banner outside Stephen's Green in Dublin. Mary Molloy of Dublin Lesbian and Gay Collective also in the picture. 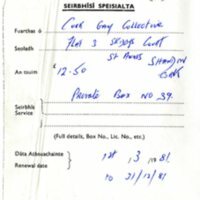 Handwritten notes outlining the background to the establishment of the Cork Gay Collective, its initial development and relationship with the Cork IGRM (Irish Gay Rights Movement). 1981 Receipt No. 1366 for P.O. Box No 39 for Cork Gay Collective from An Roinn Poist Agus Telegrafa. From 1/3/81 to 31/12/81. 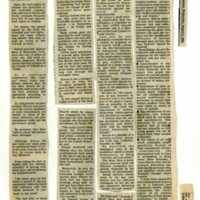 Request for people to participate in a taped discussion on the experiences of lesbians and gay men in the Quay Co-op in Cork as part of the preparation of an article for inclusion in the Irish publication Out For Ourselves (published in 1986). 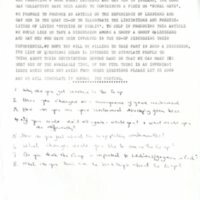 Letter from Donal Sheehan on behalf of Cork Gay Collective to Gay Miners Support Group in Sheffield. 28 September 1984. 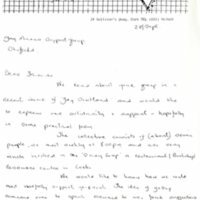 Letter offers support and suggests getting a speaker from the Sheffield group to visit Cork. 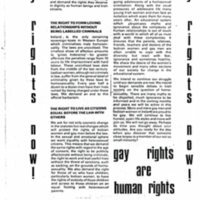 Information sheet prepared by Cork Gay Collective to keep in touch with other LGBT groups and activists. September 1984.